The San Joaquin Valley lacks doctors. 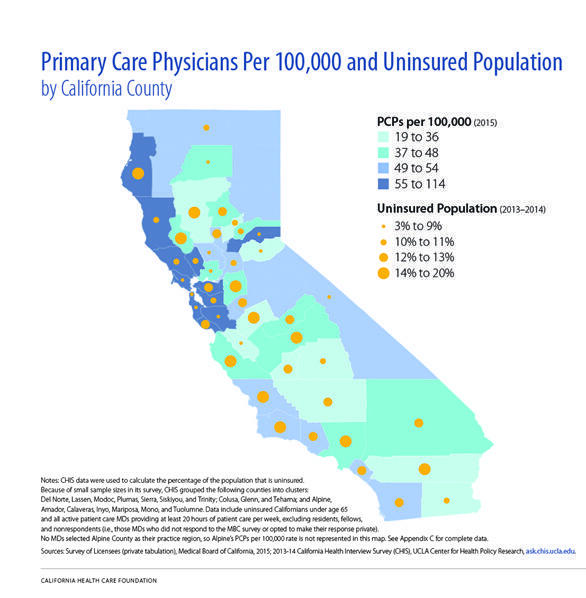 For every 100,000 residents, the Valley has 39 primary care physicians—22 percent less than the state average of 64—and an even lower share of specialists. The supply is also short for health professionals who accept Medi-Cal and plans through the Affordable Care Act. Simultaneously, the Valley has an outsized need for doctors. Home to concentrated poverty and some of the most polluted air in the country, the Valley’s four million residents suffer from elevated rates of asthma and obesity compared to the rest of the state. Life expectancies for poor and affluent residents can vary by as much as 20 years. “Struggling For Care” is a collection of in-depth reports, testimonials and panel discussions examining what this shortage means to residents, what some health professionals are doing about it, and why the Valley has such a tough time holding on to doctors in the first place. Have you experienced the doctor shortage? Leave us your story in a voicemail at 559-862-2714. The Association of Health Care Journalists has awarded Valley Public Radio's Kerry Klein first place honors in the group's annual awards competition for her reporting series Struggling For Care. The four-part radio project tells stories about the shortage of physicians in the San Joaquin Valley. The award comes in the category Health Policy Reporting (small outlets). As part of our series Struggling For Care, we invited listeners to call in with their experiences trying to find doctors in the San Joaquin Valley. Some audio clips below are directly taken (with permission) from voicemails left on our tip line, others from more in-depth conversations. All highlight the frustration, helplessness and occasionally high stakes of a region with too few medical providers. When we consider medical providers, what comes to mind may be doctors, nurse practitioners and physician assistants. But what about pharmacists? A new law has allowed them to greatly expand their role to become providers—which could be good news for patients struggling to access doctors. But one major obstacle still stands in the way of pharmacists taking on patients. This latest installment of our series Struggling For Care begins with the story of a community pharmacist in Kern County looking toward the future. As we reported earlier this summer, the Fresno area could soon be home to two medical schools. While that may seem like a great opportunity for creating home-grown doctors, research suggests local residencies and fellowships could be more important for keeping doctors here. But the Valley lags behind the state in those training opportunities, too. Be Public Live: "The Valley’s Doctor Shortage: Impacts, Root Causes And Potential Solutions"
The San Joaquin Valley lacks doctors. For every 100,000 residents, the Valley has 48 primary care physicians—25 percent less than the state average of 64—and an even lower share of specialists. The supply is also short for nurse practitioners and providers who accept Medi-Cal and plans through the Affordable Care Act.